Can We Grow Out Of Our Debt Problem? 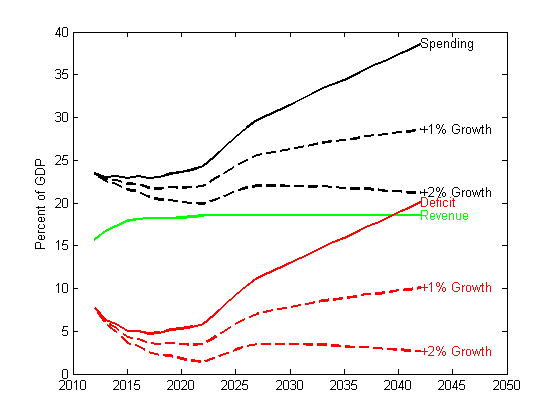 John Cochrane plays around with some of the CBO projections and comes up with this graph which represents the long-term outlook based on their numbers. Sort of OK for the next say seven or eight years and then things get really ugly. Cochrane properly asks, “So what can adjust?”, as the scenario represented by the graph isn’t sustainable. Well, the answer is that you can’t adjust revenues up or spending down enough to bring the numbers into any sort of range that will tempt investors to continue to finance the country and that leaves only one out according to Cochrane – Growth. Here is what he sees happening if growth exceeds the CBO’s assumption (2% in the out years) by 1% and 2%. Whew, saved! At least we are so long as we chug along at around 4%. If we don’t and growth falls 1% or 2% below forecast then things go to hell in a handbasket really quickly. You can flip over to Cochrane’s post to see what that scenario looks like, just make sure the kids are out of the room first. So full speed ahead on the growth agenda. Er, what growth agenda. As Megan McArdle pointed out some time ago, it’s all well and good to say that all we need is growth but there are some pretty good reasons why it’s hard to get. 1. Every year that we delay returning to trend growth (hopefully by way of a few years worth of above-trend growth), makes future finances considerably worse. We are currently in the demographic equivalent of our peak earnings years: most of the baby boomers are still at the height of their earning powers, and most of them are still in the workforce. Ideally, we’d be growing fast now, to cushion against the inevitable slowdown. But we’re not. So this “one time factor” has lasting impacts. 2. The Bush tax cuts are no longer a “one-time factor”: most of them were made permanent, as both Democrats and Republicans wanted. That is going to add a permanent $300 billion, and growing, to our annual deficit. No one has proposed any way to pay for this. 3. There’s always a risk of another “one time factor”. No one saw this one coming. If we have another, the debt we’re accumulating now will leave us in a worse position to pay for it. Of course, we could have a happy growth surprise too–but it’s not unreasonable to say that we should prepare for emergencies, not unexpected growth. Presumably, if it materializes, we’ll have little trouble spending it. 4. High levels of debt (and the taxes needed to pay for it) have a negative effect on growth. By the end of this year, the federal debt held by the public will probably be something like 78% of GDP. That may not be high enough to exert a serious drag on growth, but it’s getting pretty close. 5. Just an aside, because I know what you’re thinking: infrastructure! But at this point, infrastructure isn’t going to turbocharge growth, because we already have a lot of infrastructure. In Vietnam, putting in a paved road and a modern port facility can easily pay for itself in higher growth, because right now, it’s very hard for goods to move or factories to be built. But the United States already has paved roads and modern port facilities. Infrastructure investments here are often repairs or replacements, not radical capacity improvements. That’s not to say that we shouldn’t do them. But this spending is in the category of “keeping ourselves from getting poorer”, not “making ourselves richer”; we shouldn’t expect it to raise the trend growth rate. Even things that could actually improve productivity, like some of the smart grid innovations, are not going to deliver an extra 1% of trend growth every year. That doesn’t mean that we shouldn’t spend money on needed infrastructure. But we should not act as if this is a substitute for sensible budgeting. It isn’t–any more than buying a house was a good substitute for saving in 2005. So more growth would be nice and certainly heal a few wounds but you can’t conjure it. Assuming that we only get some help from higher GDP how then do we adjust. Cochrane thinks that since federal revenues have never exceeded 20% under any tax scheme that we are destined to forever raise no more than that. Likewise he sees no prospect of bringing spending back to its historical range. 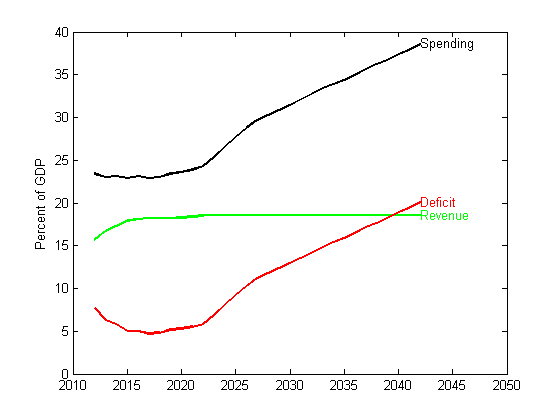 I think that both spending and revenues will adjust. Just because the government has never succeeded in claiming 20% of the economy doesn’t mean that they can’t tomorrow. Yeah, it’s probably true that you can’t do it through the income tax but that just means you find another vehicle. The VAT is sitting out there waiting to fill the hole. As for spending, it won’t go to the levels Cochrane’s graphs project. Entitlements are the drivers of ever expanding spending and they will be reined in. Means testing for Medicare and Social Security will come along, likewise age thresholds for qualification will be raised. Obamacare will likely morph into a single payer system providing the ability to gut the profits accruing to the health care industry bringing spending in the sector closer to the level enjoyed by other developed countries. None of this is desirable and to the extent it comes to pass is going to lead to a more brutal and probably less free America. Growth alone isn’t going to be enough to get us back to a sustainable position. We may raise taxes and limit spending significantly in response to markets or we may do so proactively in order to fend off the market response but do them we will for there will be no other choice.